This is a discussion for the topic Which indicator ring? on the board Beach Buggy General Help. Does it matter which cancelling ring I use? If so, which do I need? I think there's two types, early and late. do not recognise that one as there is a horn contact on the top that the steering wheel horn pick up runs on. What dip switch is fitted as thinking that is a very early column. There is a dip button on the indicator stalk. To be honest the column parts are all a mixture to get things how I wanted but can't remember all the details. It's hard work trying to remember where I left off 4 years ago! guessing you need an early ring as Dave said arms with micro switch on the end for dip and main stopped in 68 and up to 65 you had a floor mounted dipswitch but thinking all beetles had steering wheel horn push fron the 50's so it should have contacts for the horn and brown/black wire for the horn from memory. you will need more research to find your switch on a photo with a date for it. 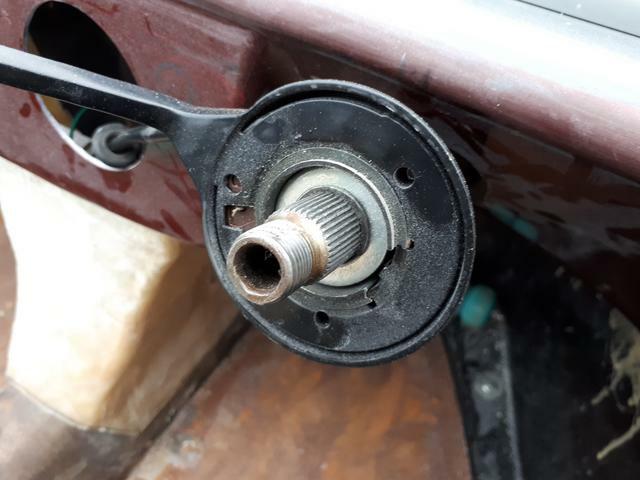 what steering wheel are you using as the boss may have a suitable peg to fit down into the slot or a simple piece of bent and shaped tin plate fixed to your wheel would do with some fettling to get it right. I guess your horn is on the dash not the steering wheel boss. Yeah that's an idea, might have a go. Horn will be on the dash.